Provide comfort for the family of Willia Kiddy with a meaningful gesture of sympathy. Willia Wilt Kiddy, 88, passed away peacefully January 20th, 2019. Born on November 8th, 1930 in Greenspring, West Virginia. She was the daughter of Guy Wilt and Eva Wilt and wife of the late Francis Kiddy. 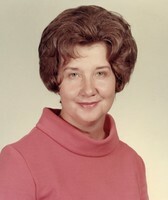 Mrs. Kiddy worked as an Administrative Assistant for Federal Government. Left to cherish her memory is: daughter, Beverly K. Johnson and her husband Steve; sons: Russell Dale and wife Kathy, James Randolph and his wife Gail; grandchildren; James, Jeremiah, Christy, Russell, Jonathan, James and Timothy; great-grandchildren Corbin, Joseph, Alissa, Brooke, Rylee, Eowynn, Avery, Daniel, Finnegan, Audrey and Laura. A graveside service will be held at 11:00 am, Wednesday January 23rd, 2019 at Chesapeake Memorial Gardens. In lieu of flowers memorial donations may be made to the Peoples Baptist Church, Missions Fund. To send flowers in memory of Willia Wilt Kiddy, please visit our Heartfelt Sympathies Store. We encourage you to share your most beloved memories of Willia here, so that the family and other loved ones can always see it. You can upload cherished photographs, or share your favorite stories, and can even comment on those shared by others. Provide comfort for the family of Willia Wilt Kiddy by sending flowers.